The hiatus is over, and final editing is now under way on Prepper Mountain. This novel has a storyline and characters I absolutely adore. It’s honestly my favorite series I’ve written, though Northwoods and Savage Horde remain deeply special to me as well. Better yet, it's not just a single release. Take this as my announcement of a new two-book series coming soon! First off with Prepper Mountain, then Shadow Warriors later this summer. It's new release time! 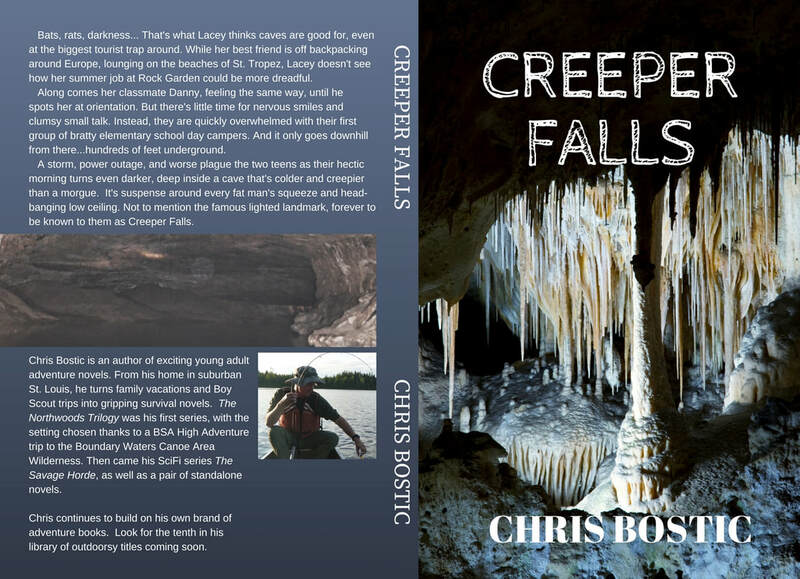 Out now, my latest standalone adventure book, Creeper Falls. Meet new characters in an exciting, suspenseful thriller set a quarter mile below the surface. You've been waiting patiently...and here it is. Complex Three: Book 3 of The Savage Horde Series. A huge thank you for taking the time to read my latest release, especially if it meant you loved the first two books so much that you had to keep going with the series. I am beyond thrilled to let you carry along with these brave teens and their grizzly sergeant. Your support means more than you could imagine. New year, new releases! Sadly, the end of 2016 spelled the final days of Rocking Horse Publishing. Two of my favorite action/adventure books, Murder Cover and Game Changer, lost a loyal publisher. After taking a little time to evaluate my plans, I've moved forward with new, self-published editions. Both books, while retaining all of their original charm, have been newly edited and re-released as second editions. Look for them on Amazon at a new, lower price! New books are in the works too. Be on the lookout for Complex Three, which is Book 3 of The Savage Horde Series. It should be ready by early February 2017. My first entries into the world of self-publishing are now available! Check out Savage Hills and Cold Valley! How about another first? These novels mark my first entry into the world of Science Fiction writing. The paperback of Savage Hills was released on May 27th. If you are a KindleUnlimited subscriber, the ebook is free for download on Amazon. The second book in the series, Cold Valley, has also been released. Next up, the third book--Complex Three. Look for it by early February. Below, here's the cover of Savage Hills, Book 1 of The Savage Horde Series. Murder Cove! The eBook came out on September 16th, and the paperback followed shortly thereafter. If you are a KindleUnlimited subscriber, the ebook is free for download on Amazon. Newest Release!! 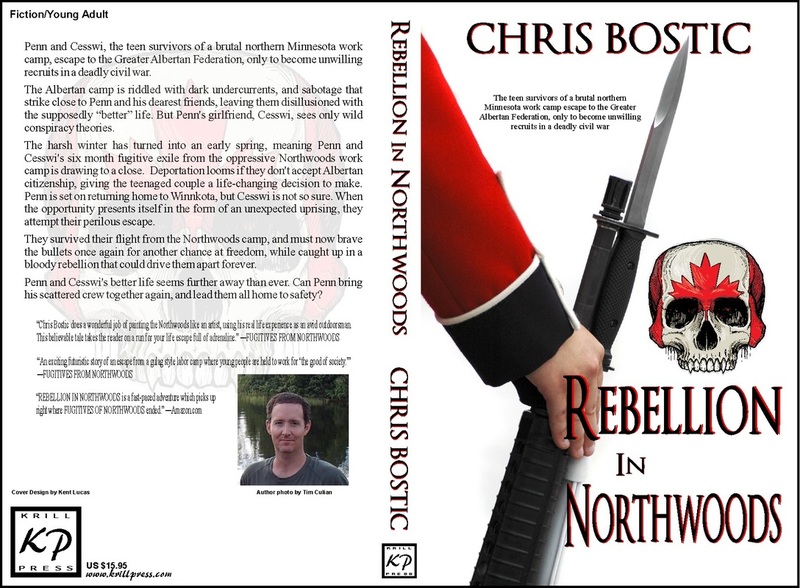 The final book in the Northwoods Trilogy has been published. The eBook came out in late May 2015 followed by the paperback in mid-June. Available at Amazon and Barnes & Noble. Released early in February, here's the young adult adventure novel likened to Deliverance...for teens. It's a Game Changer! Also available as an audiobook on Audible, iTunes, and Amazon. Also released in early 2015, the audiobook version of Fugitives from Northwoods. Narrated by Eddie Frierson. For sale on Amazon, Audible, and iTunes. The full book cover of Fugitives from Northwoods. Available now! A father of three, Chris shares his outdoors passion with his family and a Boy Scout troop. Chris' teenage son, Jonathan, is an Eagle Scout, and many of their camping adventures have found their way into stories. His red-headed middle child, Helena, has a passion for reading (and is a budding young author). His youngest child, Julia, is a very smart kindergartner who is growing up too fast--but keeps him young at heart. Despite a full time job and a busy family, Chris has dedicated every minute of his spare time to writing.